Stack Up Your Savings At Kohl's! You are here: Home / Great Deals / Stack Up Your Savings At Kohl’s! Stack Up Your Savings At Kohl’s! Here’s a deal at Kohl’s this weekend. These SO® Uniform Bootcut Pants – Juniors are currently$21.60! The accompanying ® Solid School Uniform Polo – Juniors are 50% Off at $10! There is a new Online Exclusive promo code to get 15% off Back To School items (ends August 1) and there is a code (ends July 26) to get $10 off any $30 purchase! Here’s how to Stack Up Your Savings At Kohl’s! 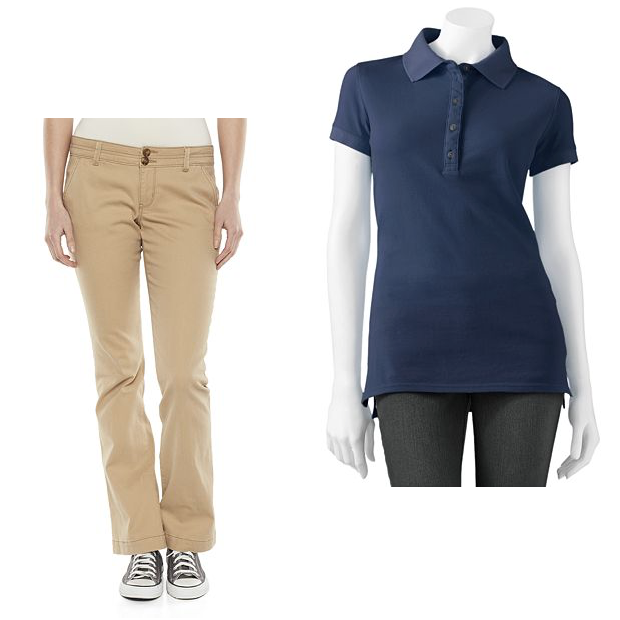 Buy 1 pants and 2 polos for a total of $41.60. Use promo codes SCHOOL15 to get 15% off all 3 pieces and the total is now $35.36. Use promo code HEATWAVE10 at checkout to get an additional $10 off! Now you have a pair of pants and 2 shirts fro just $25.36! And you can ship to store for FREE!